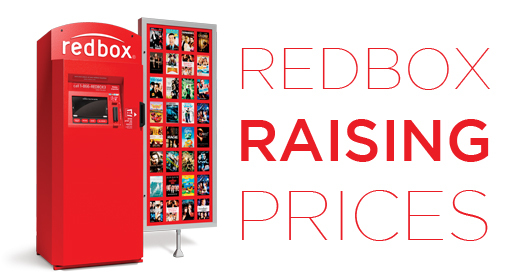 Redbox has announced price raises across the board starting December 2nd. DVD rental prices will increase by 30 cents to $1.50 a day, while Blu-ray rentals will increase to $2 a day. Shockingly, video game rentals will increase from $2 to $3 a day. So why raise prices? It seems the Blockbuster killer is taking a bit of its own medicine. Sales have been dipping even though Redbox’s parent company Outerwall saw an increase in their stock values after the news was announced. The bigger picture here is this: is Redbox still viable? Forget the price raises, is the hard copy rental industry even viable anymore? I think the answer for Redbox is pretty clear: they aren’t adaptable, and it’s going to cost them. It already has, apparently, in a way you might not realize. Video gamers, I’m talking to you here. Redbox refused to embrace the new generation of gaming consoles, and yeah, while there are still a lot of people out there firing up Xbox 360’s, more people are powering on an Xbox One or Playstation 4; some people own Wii U’s too, and Redbox doesn’t have anything for you. A few weeks after these consoles launched, we here at justusgeeks.com reached out to Redbox to ask them when we could expect to pick up copies of new games for our new consoles. Their answer? They must still be playing Wii Sports and watching DVDs. Redbox was revolutionary in presenting a service to us we had always used, but in a quicker and cheaper way. Maybe Redbox has seen the writing on the walls. Digital streaming and rental services are the future, and there are plenty of places for you to “try before you buy” with the latest game for you Playstation 4. I can’t even tell you the last time I used a Redbox kiosk, and there are 10 within a reasonable distance to us here. iTunes, Amazon Prime, and other streaming services offer me movies well before Redbox has them, and I never have to leave my house. I can watch them on any of my devices, there are no late fees, and honestly, it’s just easier. Change or die Redbox? Too late. I have never once used Redbox. Granted, I did work at Blockbuster until 2011 and got free rents. Since then, it’s been all streaming for me. It’s only a matter of time for Redbox I fear. News on the Female Thor!